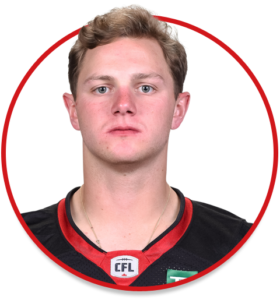 Danny Collins is a quarterback currently playing with the Ottawa REDBLACKS. Worked mainly as a fourth-string quarterback but had the opportunity to step-up a third-stringer due to injury of teammates. He only saw three games during the regular season but didn’t make any throw attempts or rushing attempts. Played football in Germany for the Frankfurt Universe. In 20 games played at the University of Maine, he had 301 completions in 591 attempts for 3917 passing yards, 24 touchdowns and 26 interceptions. While attending Williamstown High School, he led his team to the 2011 West Jersey Football League American Division Championship and a pair of South Jersey Group IV Playoff appearances. He was also named to the All-West Jersey Football League First Team and was the Thanksgiving Game MVP in 2011.